How many years your air conditioner will last depends a lot on how well you take care of it. 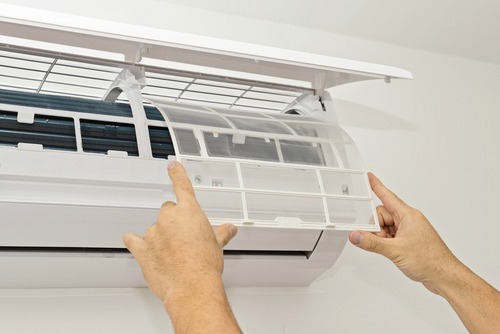 With a little attention and maintenance, such as regularly changing the air filter and utilizing a programmable thermostat, you can maximize the life of your air conditioning unit. The simple steps listed below will save you money by lowering your energy costs and minimizing repairs as well as by delaying the need for a replacement. A trained HVAC technician is your first line of defense when it comes to protecting and maintaining your air conditioner. During a service visit before the start of each cooling season, the technician will thoroughly clean the unit and make repairs or adjustments as needed. Doing so will prevent costly repairs down the road, and keep your system running as efficiently as possible for as long as possible. The air filter keeps your air conditioner (and your home) clean by preventing dust and debris from building up inside and ensuring sufficient airflow. This prevents breakdowns and extends the life of your system. Filters also help your unit operate at maximum efficiency, so your energy bills stay as low as possible. Air filters do get dirty, however, and once that happens they can no longer do their job. Check the filter periodically to make sure it isn’t clogged and change it every 30-60 days as needed to keep your air conditioner running smoothly. While the air filter keeps the indoor unit clean, keeping the outdoor unit clean is equally important to prevent mechanical problems. The area directly around the unit should be free of any debris, such as leaves, that can get inside. Maintain sufficient clear space around the unit so it can intake and exhaust air properly. Don’t plant shrubs too close, or stack things on or against the unit. A programmable thermostat makes it easy to adjust the temperature when you’re away or at night so that your air conditioner is not running when you don’t need it. With preprogrammed or custom settings, you can set it once to match your schedule to save energy, money and wear-and-tear on your air conditioner. Air leaks that allow warm air in and let cool air escape make your air conditioner work harder than necessary to maintain a comfortable temperature in your home. This wastes energy, raises your energy bills and shortens the life of your system. Check the caulking and weatherstripping around doors and windows every year and repair or replace it as needed. The sun coming through uncovered windows can quickly heat up your home and keep your air conditioner running. Insulated or even non-insulated blinds and curtains, particularly on windows that get direct sunlight, will help keep your home cool and give your air conditioner a break. Proper airflow is necessary for your air conditioner to work efficiently. Make sure air vents are clear and unobstructed to allow air to circulate freely throughout your home. For help with all your air conditioning needs, contact Rheem Pro Partner in Colorado and Wyoming today!